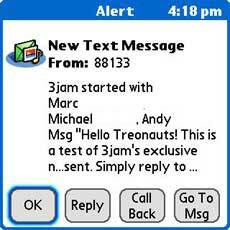 You may recall that about six months ago I wrote about a company called 3jam which is the first and only company in the world to offer “Group SMS Messaging”. The 3jam is completely free and essentially allows you to send a single text message (SMS) to a group of people and for any one recipient to then be able to “Reply To All” by simply responding to the original text message that he/she received. In the demo version of 3jam that I had originally reviewed users had to first register their mobile number then ‘program’ their first “Group Starter” SMS by either using an existing ‘3jam Nickname’ for the people they wanted to contact or alternatively manually enter the mobile number for each person. Since both these options were just somewhat tedious and time consuming 3jam has now introduced a terrific small dedicated Treo application called 3jam Starter (available to download free exclusively in the Treonauts Software Store) that completely removes the need to program your initial “Group Starter” SMS and significantly improves the speed with which you can start a group SMS conference. The ‘3jam Starter’ program allows you to: 1) quickly “Lookup in Contacts” or “Add Manually” a mobile phone; 2) write your starter text message and 3) send your text message directly from within the application – all without the need for special codes of any kind. Within a couple of minutes of sending your starter message you will get an SMS confirmation (above left) and any recipient is also immediately able to reply back to you and all others in the group simultaneously (above right). 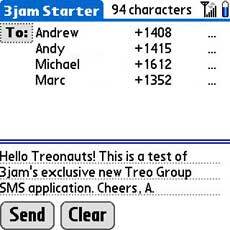 If you’re looking for a quick and easy way to start a group SMS conversation on your Treo you won’t find a better solution than 3jam – I mean that literally. Any word on when this will be available in Europe, the place where the SMS was born and continues to be HUGE??? Fred - My understanding is that 3jam are very much planning to support "Global SMS Group Conferencing" - it's just that currently their free business model does not allow them to support costly international SMS charges. I have been using 3Jam for a week...excellent product, huge amount of fun, and delightfully works exactly as represented! 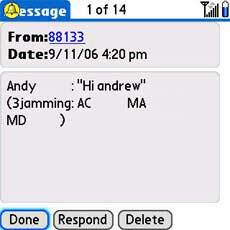 I think 3jam was good a while back ago, but I found two things wrong with the service, one was the lag time in messaging, and the other was the need to put it all my friend's names or phone number in a message that is limited to 160 characters. Doesn't leave much room for the message. I started using Peekamo.com recently and find it to be much better group messaging solution. I also like the archiving feature so I don't have to save all the messages on my phone. It's worth a try for anyone looking for a 3jam alternative. 3)I couldn't figure out how to, or they don't allow me to preselect, label, and save a group of recipients as my own saved private group, so that later I can simply send a group message to all those people by "text to: 'track team', for example or "text to: 'work buddies'. -It seems much more oriented towards group messaging people you don't know personally, but find through their 'mySpace-like' social groups on their site. Can't anyone get it right? 1. Yes, you have to sign up for the service. Why you may ask? To proactively combat spam. We do not want people to come to this site and just feed in numbers and send out spam. We feel registration is a way to combat that. 2. All the answers you seek are in the FAQ. 3. Its the group section that lets you do what you want to do. If you wanted to create a group of your "track Buddies", then you would create a private group, get your buddies to join that group. Then you could send that entire group a message, from either your PC, or you mobile phone. (SEE FAQ section at www.peekamo.com for instructions.). Sorry you had a difficult time. Your feedback is appreciated and we will definately look into how to make this better baised on your comments. Thanks for your feedback on starting a 3jam reply-all conversation. Sounds like you were trying to do so using text commands to our U.S. shortcode. The easiest way is using the phone application. There are already 3jam apps available for several phones (including the Treo, Blackberry, Windows Mobile5, and others) and more are being added. The app, dubbed the "3jam Starter", lets you start reply-all conversations with any number of people in your phone's address book. It's as simple as picking multiple names, like when you're sending a broadcast message from your phone using your phone's native SMS app (available on some phones). 1) With your phone's broadcast app, 10 recipients means you're charged for 10 messages. With 3jam, replies are always 1 standard text message, no matter how many people receive them. 2) With 3jam, responses are reply-all, so everyone can stay in-the-loop with everyone else. With your phone's broadcast app, only you get the response - not great for coordination or staying in the loop! To see if your phone is currently supported, simply text START to 43526 (i3jam). For outside the US, use +447797806160 or sign up at http://www.3jam.com. We're always looking for smarter and better ways to improve communication between friends so your continued feedback is always appreciated. We hope you enjoy 3jam! Also Spamming is further discouraged by limiting group conversations to 30 total recipients in size. The 3jam website, alas, is ALSO a mess when trying to figure out how it works and how to use it, but if you can manage to get to the page of 'commands', then you can probably deduce the basics of how it works. And EVERYTHING is possible right from a crappy non-web-enabled dumbphone as long as it sends text messages/ SMS. No website required at all (although the website does make creating your groups and adding your friends names and numbers easier). Hopefully BOTH services will continue to improve -especially their websites- and then become a part of the fabric of low-cost handheld communication. Sorry to say, but 3jam is now NOT completely free. I was extremely disappointed when I found out about this the other month. Now we get 40 free texts [which is good for a 5 min convo with 3 or 4 people] and then are required to pay for anything above that.